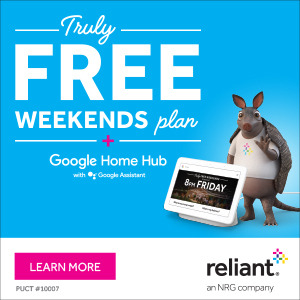 This is the third in our series of posts sponsored by Reliant. They’re covering our site for the entire 2017 Atlantic hurricane season, and in return we’re writing a handful of posts that highlight their services to readers. Today’s post relates to your questions and answers regarding choosing a generator. We’re now three weeks past the storms of Hurricane Harvey, and the rains are still fresh in our minds as we’re thinking about the next time. For most homeowners, the power didn’t go out this time, a real blessing amid the torrential rainfall. The power remained mostly on during Harvey because winds never reached sustained tropical storm speeds in Houston—but for hurricanes making landfall closer to our region that won’t be the case. Therefore, as you’re updating your hurricane survival plans after Harvey, this post will answer some questions you may have if you’re considering a generator. For Houston residents, our sponsor, Reliant, has the expertise to help take the guesswork out of the process. They can help by providing guidance about the installation process, selecting the right model, the right fuel—natural gas, portable, even solar— and addressing costs. The purpose of this post is to answer some of those questions. Is my home eligible for a Reliant generator installation? You must own the home and have natural gas line access to the house. Where do you install the generator? Reliant tries to place the unit near the breaker box. If it can’t be installed there, Reliant will work with you to find a desirable location. Will any construction be needed at my home? A concrete slab will be poured, similar to what an outside air conditioning unit sits on. A licensed plumber and electrician will run piping and wiring to connect the generator to the gas line and electrical breaker box. Sometimes these are below ground; sometimes they are attached to the house. All work done complies with building code standards. Who will perform the construction and install the generator? Professional technicians who are licensed, insured and background-checked perform all construction, installation and maintenance. How long does it take to install a generator? From start to finish, it usually takes 5 to 7 business days. Do I need to contact the city about permits for my generator installation? No. Reliant will handle all permitting for you, and notify both the city and your transmission and distribution provider (CenterPoint in Houston) on your behalf. How much power can a generator provide? Depending on the model you select, the residential generators Reliant offers deliver 8kW to 24kW of power. What size of generator do I need? This depends on several factors, which a Reliant representative will evaluate and discuss with you. Different generators can power your entire house during an outage, or only specific areas or appliances. The more items you want to run, the more powerful your generator needs to be. In general, 10kW to 14kW can run basic appliances (refrigerator, a fan, and some lights). A 15kW to 20kW generator can run a small home (no AC) and 21kW to 25kW can run a small to medium-sized home, with the higher kW generators able to support an AC system. What about a portable generator, is that enough? For smaller appliances and devices, a portable generator may deliver the power you need. Check out solar-powered options from Reliant’s sister company Goal Zero, which use advanced battery technology to draw power from the sun and can even be run safely indoors, unlike gasoline-powered generators. Finally, there are questions about cost. A generator is no doubt a sizable investment for any family. Are they affordable? How much does generator installation cost? The cost varies due to different factors: the size of the generator, where the generator is installed and whether additional piping, wiring or special permitting is required. Reliant will walk you through all your options and provide a final estimate. 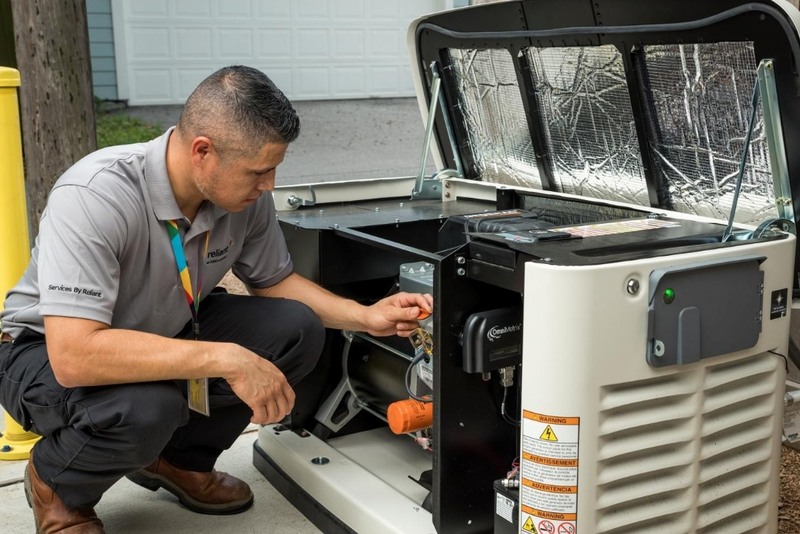 Consider too that a generator may add value to your home for future sale and rental, so it could help offset cost in the long-run. Can I get a quote over the phone? A technician must evaluate your home to provide an accurate quote. Every home is constructed and laid out differently. Are payment plans or financing available? Do I have to pay in full? Reliant offers flexible financing options, determined on a case-by-case basis with payment plans up to 10 years. If you pay outright, 50% is usually due at the beginning of the installation, and the rest upon completion. What about noise levels and general trends in Homeowner Association Deed Restrictions? Our HOA is evaluating developing a new architectural guidelines for home generators. I’ve been toying with the idea since Ike – the main issue for me is gasoline or natural gas. Natural gas means not having to run out every few hours to refill with gasoline-if you can find it and are comfortable keeping a sizeable quantity on-hand. Then again, I’m going to be at work a few days after the storm hits anyway getting the plant restarted (12+ hour days…). Also, if the natural gas system goes down, you’re “something” out of luck. My meter is nowhere near the breaker box, so a long pipe run would be needed or the breaker box would need to be relocated. My next door neighbors have a gasoline unit and let me throw an extension cord over the fence so I can recharge stuff and have a light or two. So a natural gas unit would be a nice compliment. I’m wondering if there is a diesel option. Diesel brings maintenance hassles. HEB just ripped out theie diesels and put in natural gas for greater reliability. How loud will the generator be? Will the noise upset my neighbors? The noise question, I have never been able to get a straight answer to. (I troll them at all the home shows) I have even asked if I could see and hear one that has been installed, then the reps stop calling me. So my guess is that they are pretty loud. I have a whole home natural gas generator and from the inside of my home, it sounds like a lawnmower. My power was out for 5 days during Harvey and the generator was a lifesaver. My neighbors did not complain about the noise. I think they were probably more annoyed that I had power and they did not. I agree with RG. I have a 20 KW natural gas fueled generator. It’s about as loud as a riding lawnmower. I was without power for about 24 hours post-Harvey. Never had any complaints, but do get inquiries from all over the neighborhood every time there is a power outage. As far as power requirements, I can run my 5-ton A/C unit (my house only has one unit) no problem. The installers just told me not to run too many of my big draw appliances at the same time, i.e. the oven, dishwasher, washer/drier. If I would have had a 2 A/C unit house, they would have recommended a shed switch to automatically shed and/or prioritize high-load items. Check out the ratings on Consumer Reports. One of many things they address is noise. Our neighbors have a generator that I think can power their whole house. When it turns on, we can clearly hear it from pretty much anywhere inside our house. That said, not like I’m going to begrudge them for that! As for small portable generators – I have two small ones that can be chained together to run an RV, or a fridge, freezer, a few lights, and a small window A/C. They are inverter type so they are quiet. They were not cheap. The rule is the cheaper you go the heavier and noisier you get. Some portable generators are very loud. The main problem that I have had with portable gas generators is keeping the carbs from gelling when stored. I’ve tired to follow the instruction on how to drain the carbs but its hit or miss. My suggestion is to run stabilized fuel in the unit and run the generators monthly for half an hour. The second problem with these gas generators is they are very thirsty, several gallons a day each. A natural gas generator might be better, if the natural gas infrastructure is still up after a disaster. Try using ethanol free gas. Hard to find and a bit more money but in the long run you don’t have the carb problems. Eric, how about a posting comparing the pros and cons of a natural gas system versus one that runs on propane? I have a standby generator installed at my cabin in Alaska and also have portable generators for use in my home in Texas so have some familiarity with both options. As far as I am concerned, the decision with regards to which option to choose comes down to whether or not you want to be able to run your entire house including AC units. This would require a very large, and costly, permanent installation and my choice would be a natural gas (or propane if you don’t have natural gas available) unit. This is the system we use at our cabin. It is an automated unit such that it will kick in when the utility power goes out and run until the utility power is restored. It also starts up and runs once a week to ensure all systems are functioning. These units absolutely need to be installed by a licensed electrictrician and will include a transfer switch to isolate the generator from the utility grid. If you choose not to go to the expense of a permanent installation, the use of portable generators is a great choice. Both Honda and Yamaha (and others) have 2000 watt units that can be wired in parallel with another unit to produce 4000 watts. Once these are set up outside (a must) and extension cords run into the house they can be used to power the refrigerator, freezer, lights, TV, etc. They cannot, without a transfer switch, be wired into the main electrical system. These units are small enough to pick and and carry around, are quiet and can be run on either gasoline or propane if you feel more comfortable storing propane rather than gasoline. If I am running my twin Honda generators, my neighbors probably won’t even be able to hear them. How do the generators fare in flooding? as good as air conditioning units. In other words, they don’t. LInda – Depends on the flood depth. My elderly aunt near Buffalo Bayou has a whole house natural gas generator. It sits on a concrete pad about 3-4″ in height. The water level came between the natural gas intake and the electric controls. Her service tech came out the day after the flood waters retreated, changed the oil and battery which was old and it started right up. Ran the house for 2 days including AC to start drying it out before CenterPoint could get the area back on the grid. I thought you were asking if the generator would work in a flood situation. It won’t if the water gets high enough. But, like the other response, it might be possible to resuscitate it after the flood water goes down. This is seriously the best and most useful weather site ever! Thank you both for all your great work. Eric, the 18Z GFS says that a 997 MB tropical cyclone will come ashore near Freeport the week of the 10th. I think you better sound the alarm on that one! Sounds good, but you didn’t address the issue of power outage due to flooding. My daughter had 3 generators, but all three were under water in a short time. Does Reliant recommend building a structure to elevate the generator above flood waters? Another option – which my neighbor uses – is to buy a room AC unit and just AC one room of the house – the bedroom or the den. Thanks for the advice about what sort of construction will be involved in installing a big generator. I didn’t know that a plumber and an electrician will need to access to my house. I’ll have to keep my dog and my cat locked away so that they don’t bother the workers. Thanks for helping me understand the capabilities of different sizes of generators. It’s great to know that the 15kW to 20kW can power a small house without an AC. This is an essential information because we plan to buy a generator to be prepared when calamities strike and the electrical supplies have been cut down. We live in a location where hurricanes usually occur, so it’s really important to buy the right generator to give us the electricity we need to survive. I like the USB port, and the display in white lights instead of the standard blue or red, not the most user friendly to program *update* after about 6 months of use the display has faded and you can no longer read it. Never had a clock display fade like that before.